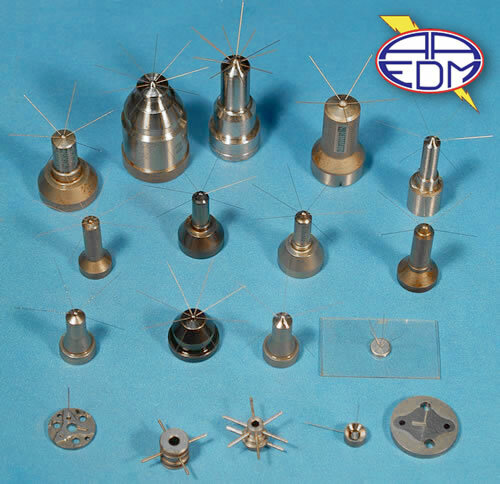 AAEDM CORPORATION specializes in precision Fasthole and Micohole EDM drilling machines. Below are a few examples of our capabilities. This is a high volume production Diesel Injector with 7 holes, equally spaced. The injector is made of heat treated alloy steel at 62Rc. The improved design with multiple smaller holes leads to better fuel dispersions in the cylinder, higher rate burning, increased power, reduced pollution. High quality hole no burrs, no taper, no micro cracking, excellent surface quality. This installation is usingour MH5 Production Microhole EDM Machine, specially designed for high volume production of diesel fuel injectors. The EDM head has X-Y-Z servo axis plus servo Rotary Table. 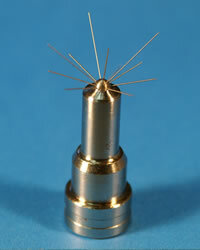 The EDM fixture holding the injector has one servo rotary axis. Using water dielectric system with back flush. Automatic operation with 8 hours of unattended operation with carousel feeder, part orientation, part transfer. The EDM performance is monitored on every hole so that defective parts can be unloaded to reject bin and do not enter the normal production flow. Flow stand monitor and integrated laser marking with data logging system. Fiber Optic LAN for superior noise immunity in hostile environment. 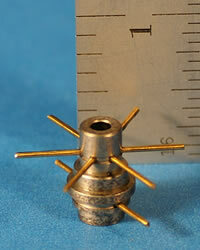 This is a Diesel Injector with 8 holes, equally spaced, low profile. The injector is made of heat treated alloy steel at 62Rc. The improved design with multiple smaller holes leads to better fuel dispersions in the cylinder, higher rate burning, increased power, reduced pollution. High quality hole no burrs, no taper, no micro cracking, excellent surface quality. This installation is using our MH5 Production Microhole EDM Machine, specially designed for high volume production of diesel fuel injectors. The EDM head has X-Y-Z servo axis plus servo Rotary Table. 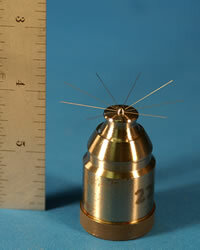 The EDM fixture holding the injector has one servo rotary axis. Using water dielectric system with back flush. Automatic operation with 8 hours of unattended operation with carousel feeder, part orientation, part transfer. The EDM performance is monitored on every hole so that defective parts can be unloaded to reject bin and do not enter the normal production flow. Flow stand monitor and integrated laser marking with data logging system. Fiber Optic LAN for superior noise immunity in hostile environment. This is a Diesel Injector with 9 holes at multiple spray angle, hole height and spacing. The injector is made of heat treated alloy steel at 62Rc. The improved design with multiple smaller holes leads to better fuel dispersions in the cylinder, higher rate burning, increased power, reduced pollution. High quality hole no burrs, no taper, no micro cracking, excellent surface quality. This is a Diesel Injector with 12 holes at multiple spray angle, hole height and spacing. The injector is made of heat treated alloy steel at 62Rc. The improved design with multiple smaller holes leads to better fuel dispersions in the cylinder, higher rate burning, increased power, reduced pollution. High quality hole no burrs, no taper, no micro cracking, excellent surface quality. This is a Diesel Injector Needle Seal with 2 holes, different diameters at 90 degrees, low profile. 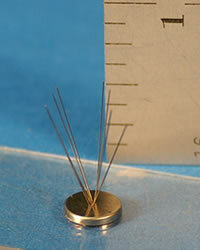 The Needle Seal is made of heat treated alloy steel at 62Rc. The new EPA emission regulation for 2010 as well as Euro 5 emission standards prompted the development of this new common rail 40,000psi injection system. High quality hole no burrs, no taper, no micro cracking, excellent surface quality. This installation is using our MH5 Production Microhole EDM Machine with one Generator and one Head with 2 different diameters electrodes, specially designed for high volume production of the Needle Seal with 2 Holes different diameters. The EDM head has 2 electrodes and X-Y-Z servo axis plus servo Rotary Table. 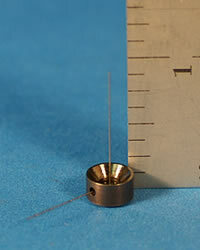 The EDM fixture holding the injector has one servo rotary axis. Using water dielectric system with back flush. Automatic operation with 8 hours of unattended operation with magazine feeder, part orientation, part transfer. There are 2 different EDM programs.The EDM performance is monitored on every hole so that defective parts can be unloaded to reject bin and do not enter the normal production flow. Flow stand monitor and integrated laser marking with data logging system. Fiber Optic LAN for superior noise immunity in hostile environment. Spray Tip Injector with 8 holes, 4 holes at 14 degrees and 4 holes at 24 degrees. The injector is made of stainless steel. Used in low pressure with flow within 1% for all parts. This new Gasoline Injector design dramatically increases fuel atomization in the cylinder, increased burning rate, lower pollution, increased fuel economy. High quality hole no burrs, no taper, no micro cracking, excellent surface quality. This installation is using our Gasoline Injector Microhole EDM Machine, specially designed for high volume production of Gasoline Fuel Injectors. The EDM head has X-Y-Z servo axis plus servo Rotary Table. The EDM fixture holding the injector has one servo rotary axis. Using water dielectric system with back flush. Automatic operation with 8 hours of unattended operation with bawl feeder, part orientation, part transfer. 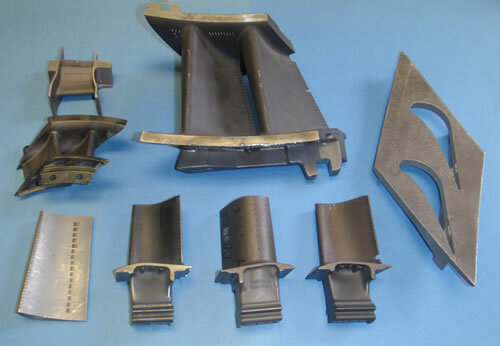 The EDM performance is monitored on every hole so that defective parts can be unloaded to reject bin and do not enter the normal production flow. Flow stand monitor and with adaptive controls and data logging system maintains flow within 1% variation. On board graph screen to monitor part flow. Fiber Optic LAN for superior noise immunity in hostile environment. This part it’s a spool made of very hard sintered metal. The harder the material the better it is for our EDM machine. High quality hole no burrs, no taper, no micro cracking, excellent surface quality. Increased production output while maintaining excellent quality. Payback of EDM machine in less than one year. This installation is using our Fast Hole Production Microhole EDM Machine with 60 Amp Generator, specially designed for high volume production of Valve Spools. 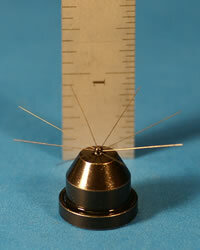 The Dual Electrode EDM head has X-Y-Z servo axis, Rotary Spindle Electrode. The EDM fixture holding the Spool has one servo rotary axis. Using high pressure water dielectric system and flushing through the Electrode.. The EDM performance is monitored on every hole so that defective parts can be unloaded to reject bin and do not enter the normal production flow. Multiple EDM programs for Rough or Finish cut Fiber Optic LAN for superior noise immunity in hostile environment. Our Series 200 Aerospace 5 Axis Fasthole machine can produce, holes, slots and shaped holes for larger aerospace blades, vanes, rings, burner, etc. The machine is a bridge with large rotary table rigid design. Control CNC and EDM combination using MS Windows. 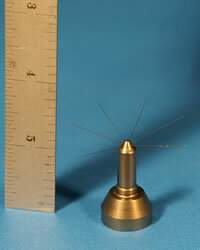 Electrode diameters usually from 0.010” to 0.200” using Tube or Solid Tungsten or Brass. Backwall impingement control. Exit hole shaping, dielectric oil or water and EDM part profile evaluation software. 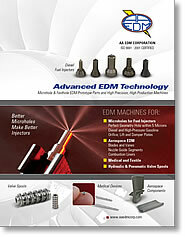 AA EDM Corp specilaizes in precision EDM hole drilling. We drill holes in a range of materials, including aluminum, carbides, inconel, steel and stainless steel. Holes can be produced with circular or non-circular shapes, K Factor (reverse taper) holes, deep or shallow entry angles, and small or large depth-to-diameter ratios—without burrs, surface distortion, minimal micro cracks and residual stress. 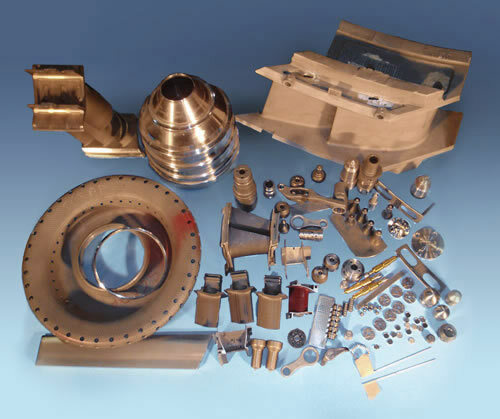 We supply to a wide range of industries, from aerospace and automotive to power generation, medical and materials.